Manikaran is a famous pilgrimage place situated in Kullu district of Himachal Pradesh State. This place is famous for Shiva temple, Ram temple, Gurudwar and hot water springs. Manikaran is in Parbati (Parvati)valley. Parvati valley is the largest valley in Kullu district of Himachal Pradesh state in India covering 90Kms length and 1085 sq.Km area. 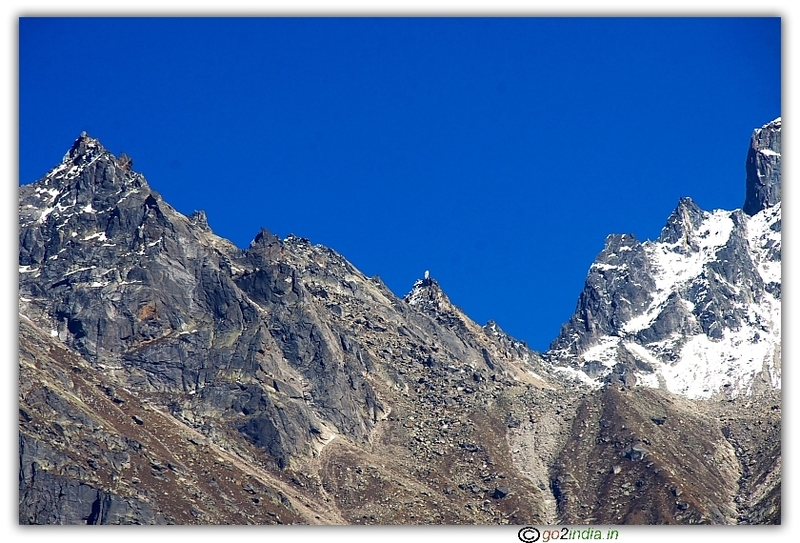 The Himalayan range of hills at Manikaran are called Shivalik range. The Parvati river flows beside the Shiva temple and Gurudwara. The starting point of Parvati river is at Mantalai. Many hot water springs are found at various places in and around the main area of Manikaran. Manikaran is 35 Kms from Bhuntar, 45 Kms from Kullu, 85 Kms from Manali, 300 Kms from Chandigarh and 545 Kms from New Delhi. People traveling from Delhi and Chandigarh have to pass through Bhuntar which is 510kms on National Highway 21 (NH 21). After crossing the town, there is a bridge constructed in the confluence of rivers Beas (from Manali side) and Parvati (from Manikaran side). Before crossing the bridge, take the right side straight road to reach Manikaran. 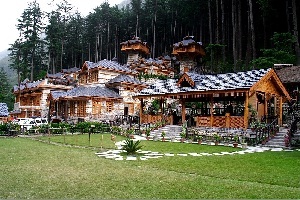 This place of Bhunter is the starting point of Parvati valley which ends at Soma pass. On the way one will find a place called Jari (20kms from Bhuntar), a beautiful restaurant, a small town called Kasol (30Kms from Bhuntar) and then Manikaran. The journey is through, dense forest, steep valleys beside the river Parbati. Most of the people prefer traveling by bus from Delhi towards Bhuntar because of the valley view which can be seen for the last 3 to 4 hours before reaching Bhuntar. This journey is beside the river Beas and valley. 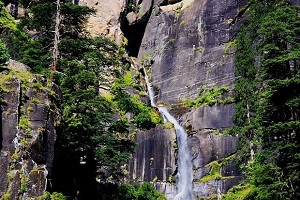 The breath taking views of valley, river flow is worth watching in this area. 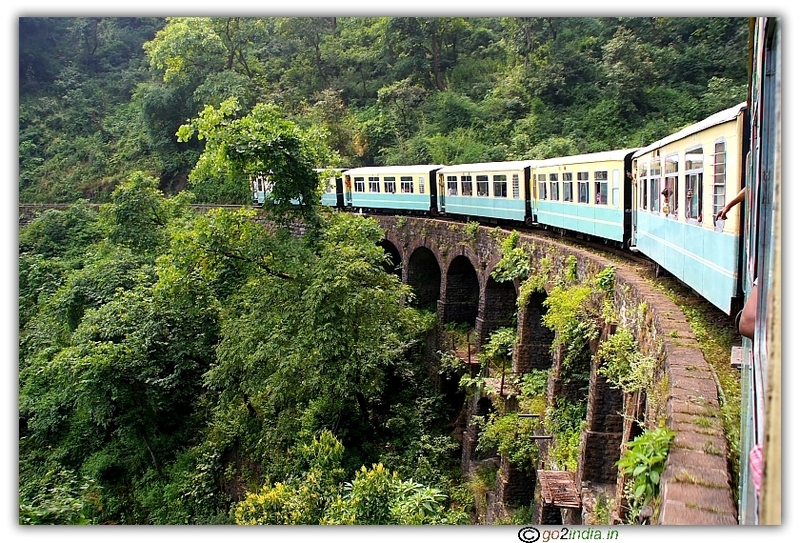 Some even book private vehicles to stop and enjoy the scenic beauty in between their journey. Volvo buses take only 10-12 hours to reach Bhunter from Delhi. Volvo buses reach this area before Sun rise and hence people will miss the scenic beauty. We traveled by deluxe bus service (NON-AC) just to enjoy the journey. Deluxe buses take more time to reach this place which is fine for those who enjoy the nature with vallies beside the Beas river flow. The journey was not easy as many people suffered with vomiting while traveling in sharp curves and steep roads. 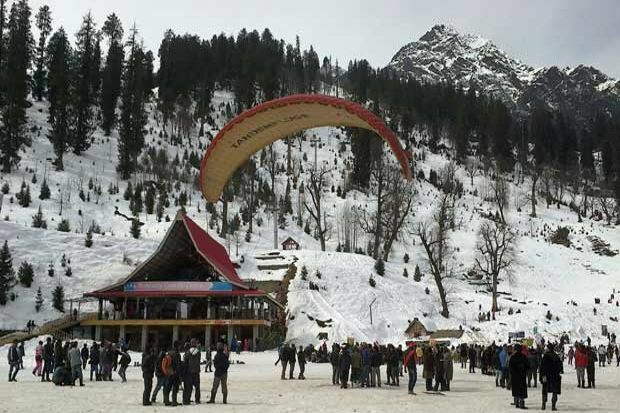 Before reaching this valley areas, there is a stop at Sundar nagar where tourists can have their breakfast and refreshments. After this stop, the journey is through valley and Beas river which mainly come at right side while traveling towards Manali. The nearest air port is at Bhunter. The nearest railway station is at Joginder nagar. This is located between Mandi and Pathan kot railway route at a distance of 115Kms from Bhuntar. There is one more railway station located towards Chandigarh at a distance of 200Kms (from Bhunter) called Kiratpur. There are two main stories behind this place. 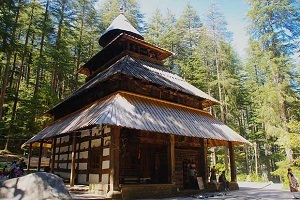 Mantalai was believed to be the meditation place of lord Shiva. Once, when he was in deep meditation, Goddess Parvati comes down from that place and takes rest at Manikaran. Lord Shiva too comes down in the same path on searching Goddess Parvati and finds her at Manikaran taking rest under a tree. This path later became the river and named as Parvati river. The second story is about the the name of this place. Goddess Parvati loses her precious stone (Mani) from the ear (karan) while being inside the river (hence the name Manikaran). This precious jewel goes inside Sheshnag. Lord Shiva comes to know about the loss of the jewel and opens his third eye on not finding it anywhere on the earth. To rescue the world, Sheshnag throws out the jewel along with other precious jewels too. It is believed that the venom which came from Sheshnag along with the precious stones, made hot water springs at Manikaran. Manikaran also has importance in Mahabharata and Ramayana. There are many believes on this place that, the wishes come true, the hot water absorbs the sins of people etc� In Manikaran, the hot water springs stretch for a distance of 6 to 7 Kms between Roop Ganga and Kasol. The temperature varies between 80 to 100 degree Celsius. Though these hot water springs are considered as due to Sulphur, the taste is good and there is no bad smell. As per the test reports, the water is radio active and is curable. On medical analysis, regular dips at these hot water springs can cure gastric complaints. We have seen in the hot water springs at Shiva temple, people cooking grains and rice using clothes and containers. All the hot water springs are located on the right banks for Parvati river. All temples and visiting places are also located on the right bank. To the left, there is bus stand, restaurants and entry into Gurudwara. The Parvati river can be crossed either at a bridge constructed at restaurant area or at Gurudwara entrance. Cross the bridge on River Parvati from bus stand (restaurants and hotels) side. It is easier to visit all the important temples and other visiting places in one stretch. After crossing the river, one can see the local villagers, houses, offices to the right. To the left, the area is commercial and if full of shops. On further proceeding, the first temple to the right is Sri Rama temple. This temple is renovated recently. The premises is very calm and neat. There is a free food and accommodation facility available (for nearly 500 visitors) in this temple. There are two water tanks (kund) for taking bath for males (Ram Kund) and females (Sita Kund). There is one more big water tank point for general public to take holy bath. The boiling water point in this area can be used for cooking rice in small bags. In front of Rama temple, there is Hanuman temple. On eastern side there is Shiva temple constructed recently. Proceeding further in the street, next comes Naina Bhagawati temple to the right. It is believed that Lord Shiva opened his third eye when he did not find the precious stone of Goddess Parvati. Beside Naina Bhagawati temple, there is Raghunath temple in the same right side of the road. One has to go below ground level to see the Gharbha Gruham of the temple. There were some repair works going on during May 2009 outside the temple. Walking further in the same road, the road becomes narrow as bazaar area approaches. There are some banks and other buildings. One has to go through this narrow path both the side of which shops are located. People will find Shiva temple to the left of this bazaar street. There is a place for safe guarding the foot wear. This temple is the main temple in Manikaran. There are two hot water springs in front of the temple. Above one of which, there is a huge statue of Lord Shiva. The area feels really hot (even the floor) because of fumes. We saw many people dipping the bags (available at the shops outside the temple) containing food grains and rice inside the boiling water. Sufficient care is taken for safety of people against boiling water. Nandi statue can be seen at the entrance which is made up of metal. The temple is newly constructed and looks very neat and clean. On the other side of the temple, river Parbati flows. Just after Shiva temple, in the same bazaar street, there is an entrance for Gurudwara at the left side. Visitors have to go inside a tunnel like area and reach the hot water tank. The Gurudwara is well organized. There are places for foot wear, safe guarding the belongings during bath, cold water facility to mix up with hot water. The tank is provided with proper mixture of cold and hot water outlets. Visitors can used buckets to first take bath and later take a dip in the tank. Separate tank is available for ladies. Toilet facility is available separately for men and women. The main Prarthana (prayer) mandir (hall) is very peaceful, pleasant and very good for meditation. There is lodging facility for nearly 4000 people at a time. The dining is well equipped. Free food is served here. One can donate at the hundi situated at the dining hall entrance. People have to take tumbler, glass and plate from the containers themselves and sit in the rows. Once the food is over, they are supposed to keep all these in the cleaning area. Free Tea is also served in the same dining hall. We found all these well managed. Gurudwara is dedicated to Guru Nanak Dev. For the present condition of the Gurudwara, the sincere effort put by Sant Sri Narayan Hari (also called Sant Harihar Narayan), is the reason. This place is also called as Harihar Ghat, named after him. He worked hard for serving people who were visiting Manikaran by providing lodging and boarding facility. These facilities were lacking at this place. Presently, Gurudwara is equipped with all kind facilities like separate hot water tanks for males and females, free food, arrangement for luggages, foot wear etc... These were made by properly utilizing the funds provided by many people for the requirement. The total management was taken care by him. Presently the administration is under the control of his close family relatives. There will be a seven days of celebrations at Manikaran during Buddha Purnima as the day is believed to be the birth day of Guru Nanak Dev. During February third week of each year, there will be functions for one week for the death anniversary of Sant Hari Har Narain. Private hotels are also available at Manikaran for staying. We found that the cost is very reasonable. Even the food is cheap for a very good menu. Very frequent buses are available towards Bhuntar and Kullu. Private vehicles can also be booked. 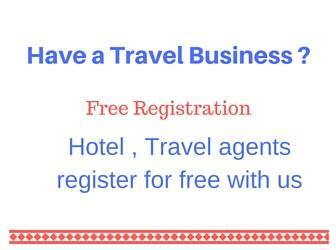 There are many booking centers for buses, trains and flights at Manikaran and Kasol. Photography is allowed everywhere in Manikaran without any restrictions. This place is a confluence of river Paaap Naashini and river Parvati at a distance of 200mts from Manikaran (towards Barshaini village) at right bank of Parvati. People take hot water dip at this place as it is considered as the place for destroying sins. Same belief also remains for Rup Ganga which is 4 Kms away from Manikaran. This is also a tributary of river Parbati. This was the place where there were silver (Rupa) mines once upon a time. These are not seen presently and the extraction of silver was not profitable. The ornaments for local God Jagatham at Barshaini village are made up of Silver extracted from these valleys. This place is located in a village called Uchich just 4 kms away from Manikaran. 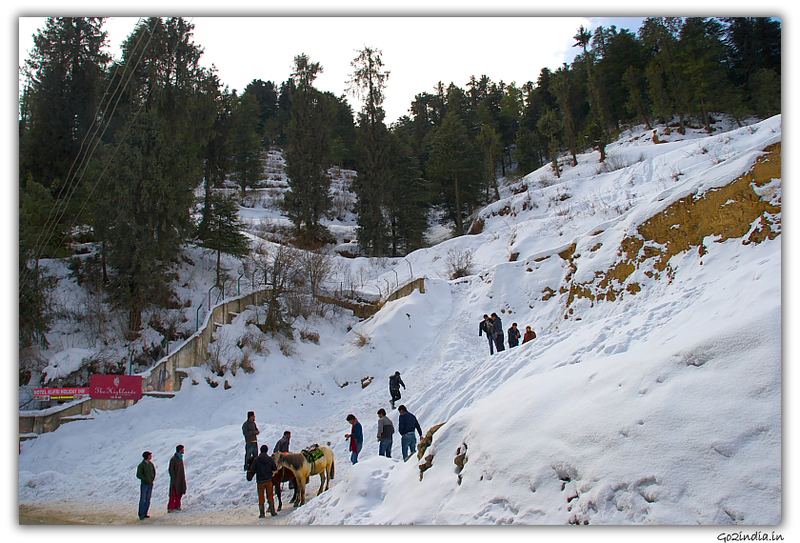 These villages are located very nearby to each other and are 14 Kms away from Manikaran. The place is full of pine trees covering valleys. Barshani village is the last village in this route for vehicles (Himachal Pradesh state government buses and private). A dam is being constructed (May � 2009) for Parvati river power project in Barshaini village area. 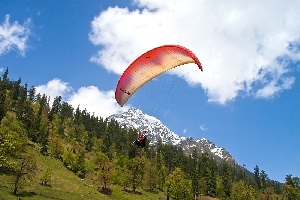 I have visited all places of "kullu-manali". I feel great. It was totally six days tour by my college. 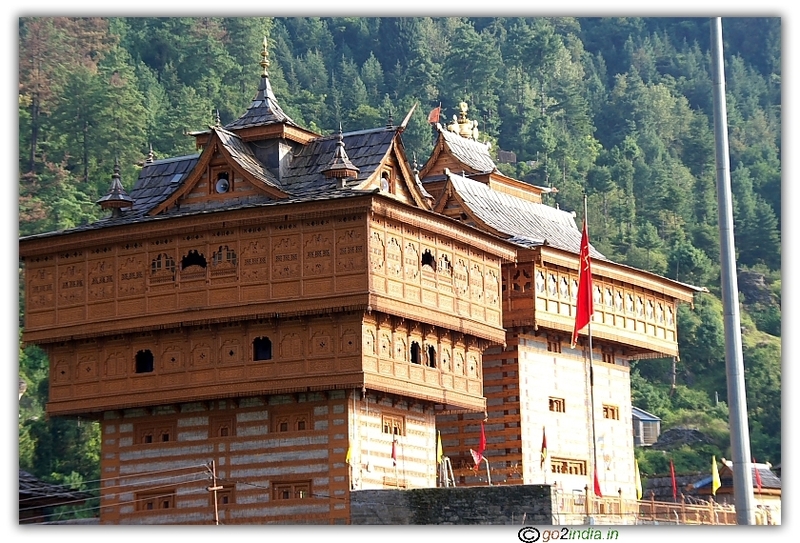 I visited ancient Hidimbha temple, Vashsisth temple that is in Manali as well as Mall road of manali. the Calm of Manali relize me that there is no more heaven on the earth. it seem am not in India. in Manikaran (Kullu) i saw the gurudwara .and all the temple beside the river parvati as well as hot water of rive. some people said it due to presence of Sulfur(S)-but there is no smell of sulfur if it is so. and some says the ancient story of lord shiv that he opened his third eye at this place. i enjoyed a lot . i never forget this trip . I would like to visit Manikaran in the last week of July. How can I reach there from Delhi. I prefer to go by train rather than road. How is the weather going to be there. Any precautions? I am 61yrs now.